Sorry, but Yemen Harazi is currently sold out. More expected by the end of March. 2013 crop arrived late July. We work directly with an exporter in Yemen who culls true specialty grade coffee and ships it to the US in Grainpro bags which isolate the coffee from any taste and odor and also controls moisture. Our direct relationship is important because often when one buys coffee from Yemen they may get a variety of growing years all mixed together, or, mixed screen sizes. This year we are importing the A+ grade of Harazi coffee, a slightly larger bean size that is also more uniform. This allows more evenness and control during the roasting process, albeit more costly. Our shipper works with growers and you can be assured of new crop, evenly graded specialty coffee, the real deal. It's expensive but farmers are assured of much higher remuneration than they would typically receive as well as investment in social programs. This is 100% authentic Yemen Mocha from a single, quality producing region. Importing this Mocha Harazi coffee directly from Yemen is very challenging. We continue to do it because the coffee is unique and we have a customers who simply love it. It arrived via airfreight rather then through conventional channels, ordinarily by sea. Yemen Harazi coffee comes only from the Haraz Mountains, an ancient coffee growing region in the isolated northwest highlands. Coffee is grown at very high altitudes and beans have a particularly hard density. Altitude of the agricultural land in the region ranges from 4500 feet to an astounding 9000 feet. Flavor is intense and characteristic of the very best Mocha coffee Yemen has to offer. In cuppings we've had several Sananis and other regional Yemeni coffees; this Harazi boldly stands head and shoulders above the rest of the coffees on the table. Coffee trees growing on steps carved into rock in Harazi. Coffee is produced in the Haraz Mountains with ancient methods, resulting in natural, dry processed coffee. 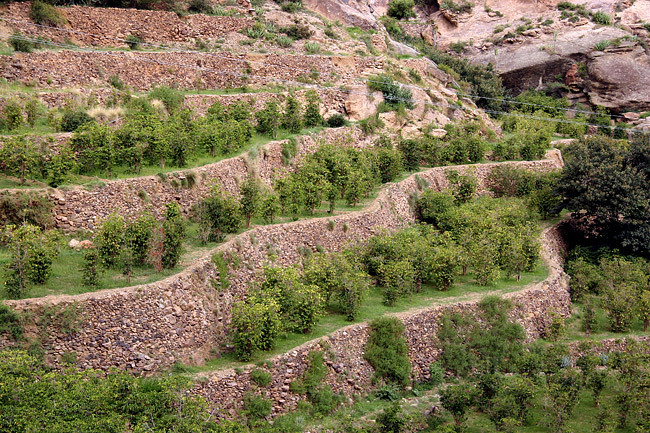 Steep, rocky terraces were carved in the rugged mountains centuries ago so it could be farmed. While not certified as such, Harazi coffee is organic by default, as there are no synthetic fertilizers nor pesticides available, and all crops are rain fed. With almost no access to commercially available farming supplies, the coffee is grown in a naturally organic environment, free of pollution. The growing methods have not changed for centuries. Cherries, picked by hand are placed on straw mats and laid on village rooftops, to dry in the sun. The farmers take a lot of care to protect their coffee from contamination, mold and other negative conditions during the two week long drying period. Once dry, beans are collected by the exporter in all the villages throughout this mountainous region, and transported to a collection center in the village of Al-Hutaib. Finally, it is conveyed to processing facility in Sanani for milling, bagging and export to waiting international buyers. Ancestral, heirloom varietals have been catalogued and include unfamiliar names such as Dawairi, Tufari and Udaini. Recently, two other varietals have been discovered, Shabriqi and Jadd'di. Some of these produce cherry year round while others produce on a yearly cycle. Still others yield cherry only every other year. Harvest is generally October and December, with other varietals harvesting in March and April. In the last three decades of the twentieth century farmers turned away from traditional crops, including coffee, to grow Qat, a narcotic, and far more lucrative endeavor. Apart from the illegality and moral issues, Qat farming destroys the soil of its nutrients and area's scarce water supply. With the help and guidance of the 'Haraz Project', as well as government incentives, many of the five hundred or so farmers in the Haraz Mountains have turned their attention back to their traditional coffee roots. Today, you will find Haraz coffee to be one of the best. For Yemen Mocha fans, choose this coffee for a most pleasant surprise. Cup Characteristics: Bold, striking clean, exotic cupping. Dark chocolate,tongue coating mouthfeel. Racy, distinctly Yemeni Mocha flavor notes. Roasting Notes: We like Yemen Harazi at Full City, preferring to pull the roast just as it begins second crack. However, taking it a little further into second crack will provide deeper tones, albeit at the expense of some floral notes. It's worth experimenting with the darkness of roast. This coffee is screen 14 and above, so it should not prove to fall through roasting grids. P2, B on the Behmor will produce a nice roast as will P3.